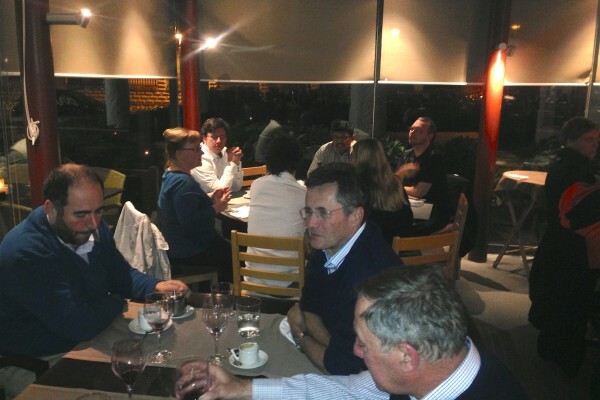 The 4th workshop on biomaterials and their interactions with biological and model membranes was held in Salou (October 19th — 21th). Following up to the previous three workshops in 2011, 2013 and 2014, this meeting mainly focused on the interactions of synthetic polymers, nanoparticles, surfactants, proteins, small biomolecules with biological and model phospholipid membranes. 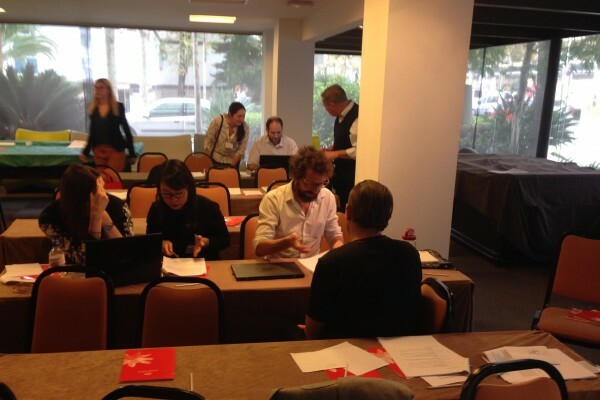 Participants of this workshops were not only SNAL-ITN members, but also external scientists from all over the world. 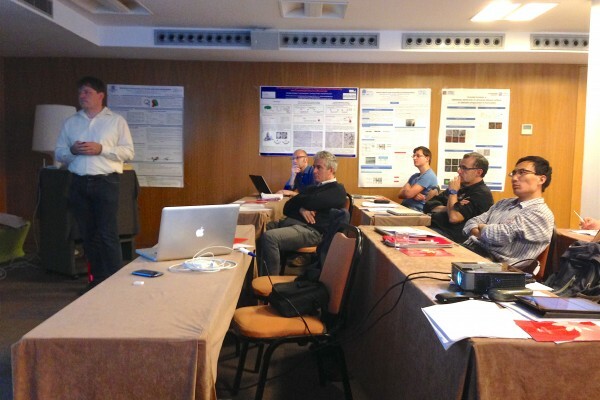 During this three-day workshop, experts and young researchers from different backgrounds (physics, biochemistry, biophysics, polymer chemistry, medicine and industry) discussed together about different topics, including phospholipid bilayer theory and computer modelling, synthetic polymers for cross-membrane delivery, supported lipid bilayers and Langmuir monolayers, bio-inspired polymers, lipid vesicles and drug delivery systems. Due to the differences of background, discussions particularly focused on multidisciplinary approaches to understand these complex problems. During these three days of workshop, participants could present a poster to show their work and exchange their ideas with others. It was an excellent opportunity for young researchers to practice and discuss with experts in the field. New platforms and experimental techniques were introduced by many biophysicists and molecular biologists. Prof. Vadim Frolov (University of the Basque Country) gave a talk about using lipid nanotube to study the interactions between GTPase and model lipid membranes. This technique along with molecular mechanics helps to reveal the nanomechanis of membrane fission. Another interesting platform was introduced by Dr. Jean-Baptiste Fleury (Universitat des Saarlandes). He talked about the applying microfluidic approach in the study of interaction between a single nano-object and a phospholipid bilayer. Dr. Sowmya Purushothaman from University of Cambridge also used microfluidic devices. Her talk was more related to drug delivery, about membrane permeability of antibiotics and Dr. Krisztina Feher (University of Gent) talked about NMR spectroscopy as a tool to study lipid encapsulation. Prof. Thomas Heimburg (University of Copenhagen) gave details about asymmetric membrane which leads to a permanent electric polarization, resulting from a lipid composition or membrane curvature. As a consequence of permanent polarization, interesting electrical phenomena such as outward or inward rectification of permeability arise. Apart from lectures about model lipid membranes, Dr. Mario Brameshuber and Dr. Eva Sevcsik from Vienna University of Technology talked about techniques used on live cells, single molecule fluorescence microscopy. By this approach, it is possible to image the nanoplatforms in live cell plasma membrane and further study the membrane organisation and protein interactions. Along with physical tools to study lipid membranes, material scientists shared their opinions about how to develop bioinspired nanoparticles. A talk given by Dr. Daniel Ruiz-Molina (Institut Catala de Nanociencia i Nanotecnologia) was about the fabrication of catechol-based multifunctional nanoparticles and nanocapsules. 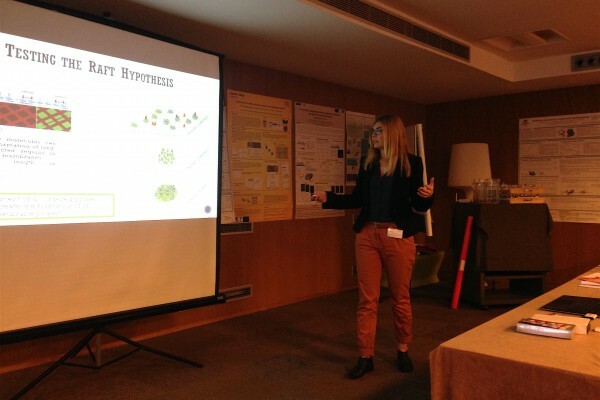 Another talk given by Marie Bachelet focused on biomimetic polymer-functionalised gold nanoparticles. Apart from lectures on experiment, lecturers presented different kinds of method to investigate the free energy landscape in the systems, which gave rise to broad discussion. 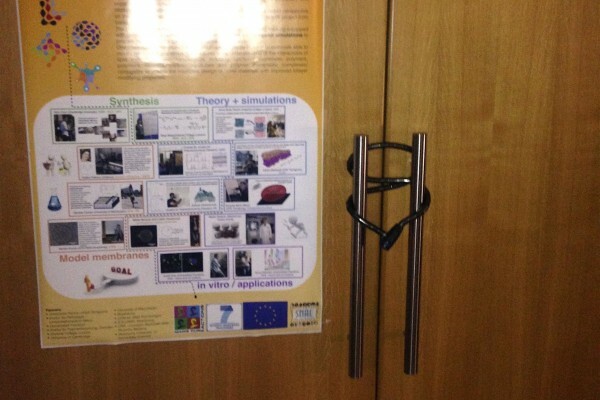 Dr. Guojie Zhang represented free energy landscape of Dynamin-Mediated membrane by a Wang-Landau sampling approach. Meanwhile, fission process crossing a transition state with a free energy barrier of about 32 kBT was shown in the talk. Similarly, Jing Yang provides a general methodology to explore the free-energy distribution for ions at complex biological interfaces and which can be extended to study other interactions of interest between ions and charge head-group in colloidal chemistry and soft matter. Dr. Lev Sarkisov showed the “patchy story” of striped nanoparticles with different sizes and different lengths of ligands decorating on nanoparticles by molecular simulation, in which he also investigated the free energy landscape with umbrella sampling. On the other hand, at the mesoscope level, Dr. Dmitry A. Fedosov modelled red blood cell with shear elasticity, bending rigidity and membrane viscosity, which was test for active fluctuations. 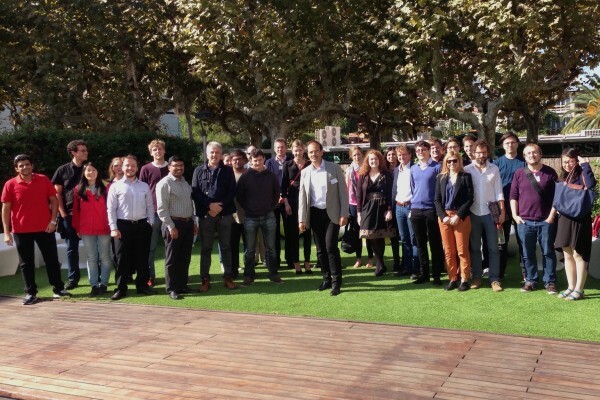 We would like to thank Dr. Vladimir Baulin, Prof. Jens-Uwe Sommer and Berardo M. Manzi for organising this workshop but also Universitat Rovira I Virgili and SNAL Marie Curie ITN Network for their financial support.